I am sharing more from our Florida visit, this was toward the end of our March visit in Ocala Florida. We walked a loop around the lake in Tuscawilla Park. It was a lovely path lined trail with some of the Spanish Moss covered trees that I just love. A Pileated Woodpecker was seen in one of the moss covered trees. Ocala is known for all it's gorgeous horse farms. 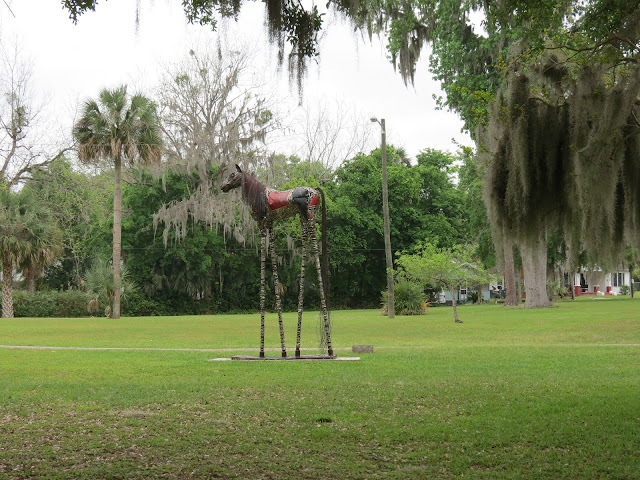 So, it is fitting that there were horse sculptures in the park. 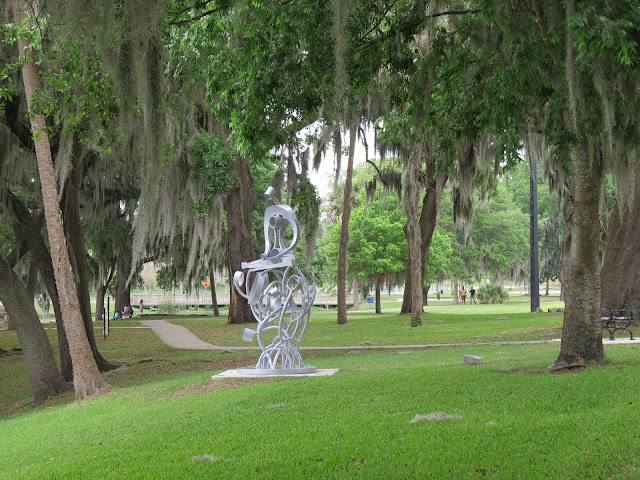 In the background are some of the native trees in Ocala and the moss covered trees are common. 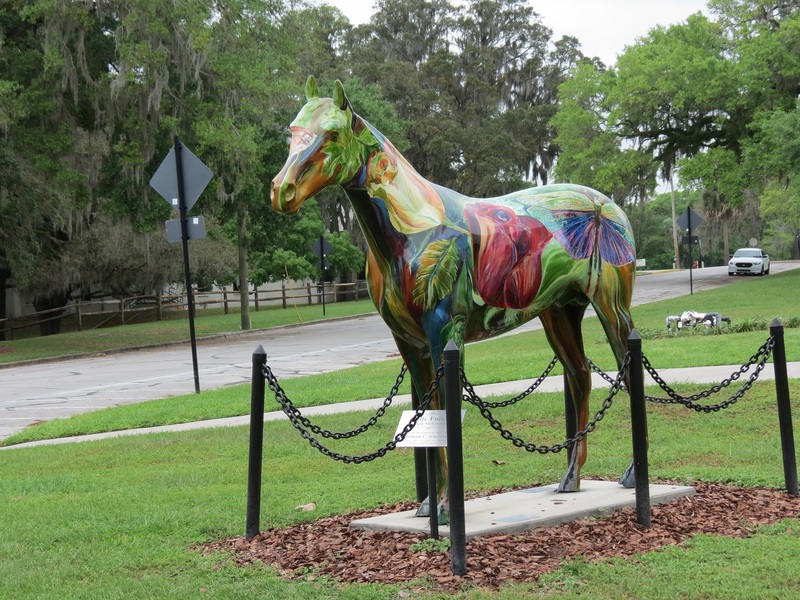 A pretty painted horse sculpture. A look at the lake and various trees across the way, I love the palm trees. I like this statue, it could be hubby and I in our golden years. 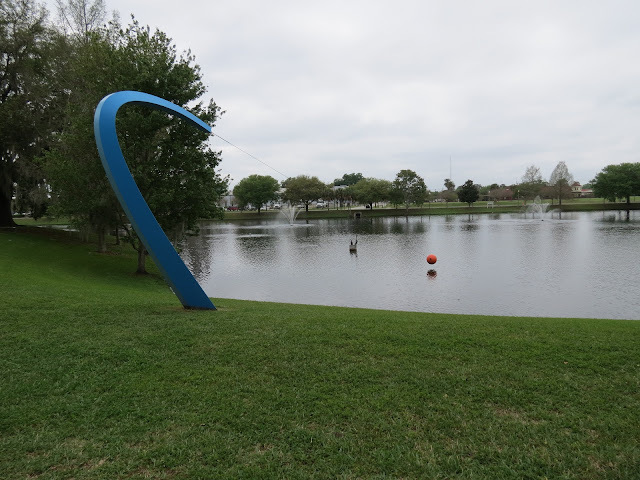 The abstract fishing pole is one of the many sculptures seen in the park. 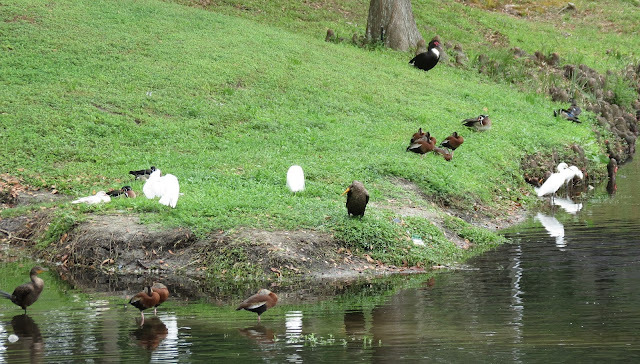 The lake shore was just covered with ducks, egrets and cormorants and anhingas. 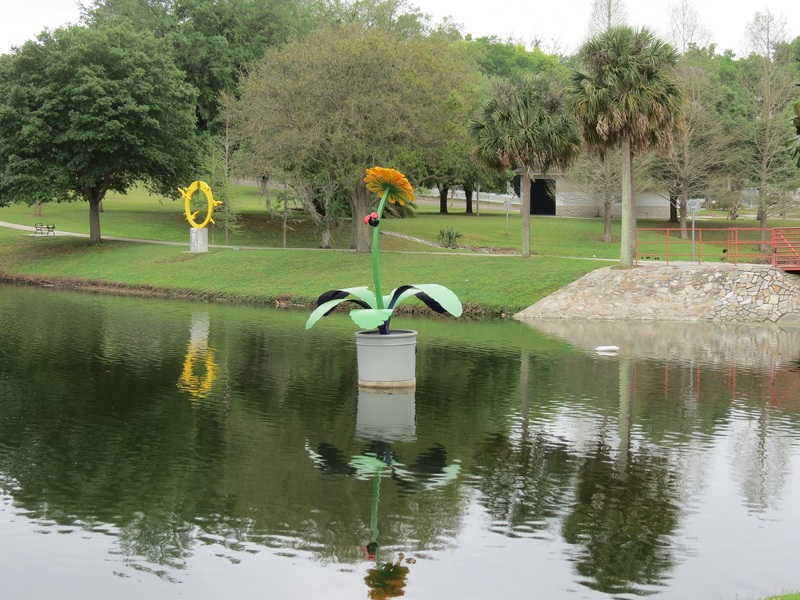 We walked the pathway around the lake checking out the birds, the lake and all the sculptures. I hope you enjoyed our visit to the park. If you are ever in the Ocala Florida area it is worth a visit. Thank you so much for stopping by for a visit. I appreciate the nice comments.. Thanks to Judith our host of Mosaic Monday and to the hosting group of Our World Tuesday: Arija, Gattina, Lady Fi, Sylvia, Sandy and Jennifer. Also thanks to Monica for hosting NF Trees. I wish everyone a happy week ahead! I love the woodpecker. The sculptures are fun too. The horse sculptures are very beautiful. Have a happy week, Eileen! What a gorgeous park to wander around and I love all the statues especially the older couple seated on the bench over looking the water. All the bird shots are fabulous as well as are the way you havemade the collages. Have a great week ahead. What an attractive coat - the red and dark grey. Superbes photos mettant bien en valeur ce très beau parc où j'aimerais aller marcher, flâner, lire et...prendre des photos, aussi. Bel été à toi. Such a lovely park with many sights to see and take photos of. That woodpecker is one of my favourite birds - not that I see them very often! A friend of mine has them visit his garden. The medley of pictures, just like an exquisite collage express your penchant for clicking the best. Such a beautiful park with those statues and birds. All of them are lovely!! Especially that painted horse is my favorite. What a great post - lots of variety and beauty - thanks. Isn't ;your woodpecker friend a handsome fellow! I suspect he knows it. There are such wonderful sculptures in the park! A wonderful way to spend the day! Have a grand week! 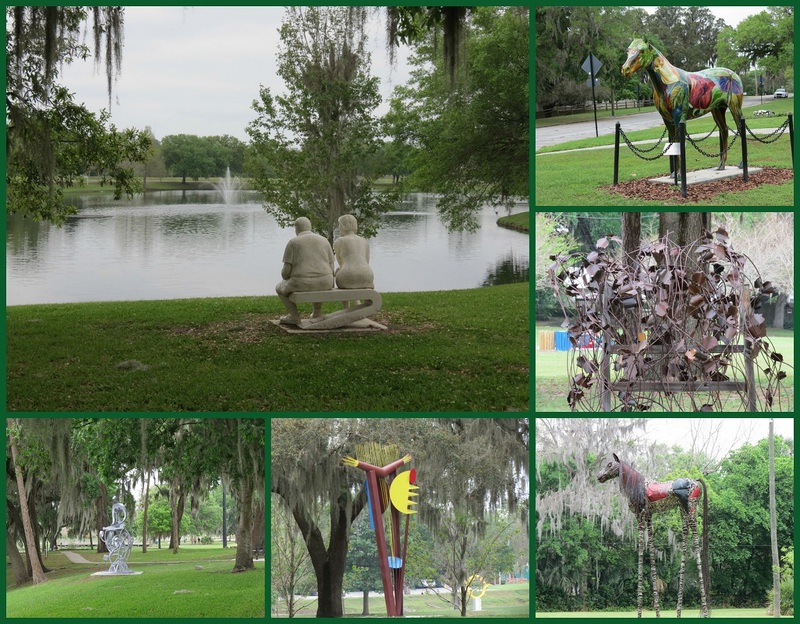 This park is a delight for all the senses, love the horse sculptures and the woodpecker captures. What a beautiful horse statue with all the colors, flowers, dragonflies, etc., images. I agree with you..."the couple" is a very realistic portrayal of an older couple enjoying the scene...sort of an "every couple." Beautiful woodpecker. The horse farms is interesting. I like the sculptures in the farm. great photos of the woodpecker! What a wonderful walk around the lake in Tuscawilla Park. I loved seeing the sculptures -- fun and clever. Great shots of the pileated woodpecker ... very handsome! I'd say the Anhinga knows how to fish. :) What a treat! Happy Monday! I wish I saw more Pileated in my neighborhood. Mostly just Northern. I love all of those. The sculptures are way cool. Love that woodpecker! It's so beautiful! Nice pics of the woodpecker! What a lovely park. A horse on Giraffe legs? Hmmm. Love the woodpecker pics. Very pretty design by nature. Wonderful shots of the woodpeckers! Wonderful photography and presentation ~ love the painted horses! I especially like the stunning photos of the Pileated Woodpecker, Eileen. Thank you for your kind wishes: I am feeling much better ... at last! Peirwszy bird is beautiful and I like all the decorations in the park. Greetings. Oh, I really like the shots of the abhinga! Ocala looks like a pretty place! Love the statuary!!! Excellent horses...we in Texas have Longhorns done this way in many larger cities. And that Woodpecker....you have me GREEN with envy. The Pileated pics are magnificent! The statues are wonderful, I especially like the horses, but those pileated woodpecker shots are fantastic! I too am green with envy. Such a beautiful bird! Beautiful park and I like that sculpture of couple on the bench. Gorgeous woodpecker, and I just adore spanish moss! What a gorgeous woodpecker! And the sculptures are all so interesting. I don't think I've ever seen an Anhinga before. Thanks!! The red on the pileated woodpecker is so vibrant and I like those horse statues. Great pictures of the birds also Eileen. The red on the pileated woodpecker's head stands out so vividly. Lovely series of photos. Eileen! I am so jealous of the pileated photos. WoW!!! The couple on the bench is a sweet scene and the anhinga with his dinner is awesome. Looks like an amazing day at the park. Hi Eileen, Glad you got to visit Tuscawilla Park. Nifty place, especially in Winter months when it is packed with waterfowl and wading birds + Bald Eagles. I agree, the sculptures are wonderful! Have a very pleasant coming week! It has been stormy almost daily but that is Florida in Summer. 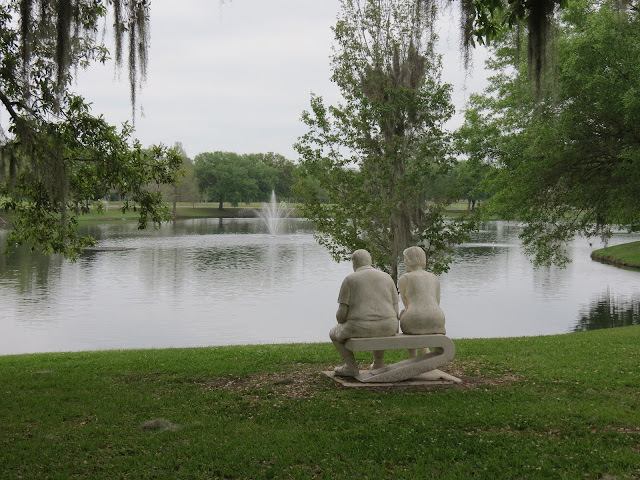 I like the fantastical statues of the horses as well as the couple sitting on the bench. There is a wee bit of “Alice In Wonderland” to be found in this place. beautiful images of he woodpecker. wish i could see one that close. What a terrific place!!! So much beauty and your captures are superb as always, Eileen!! Thank you so much for sharing the fun and the beauty!! I would love the horse farm!! Have a great week!! i love finding those special, unusual garden ornaments/statues...they are always so colorful and fun!! the woodpecker is so beautiful!!! Have a beautiful week Eileen! It looks like a great place to visit. The sculptures are beautiful and fun, and the birds very beautiful. I especially like the one you caught with the fish in its beak. I have read about Spanish Moss but we don't have it out here. Lovely! There is so much to see and absorb here. The four part capture of the bird eating fish is pretty awesome. I like the blue sculpture that looks like it spit out that ball. ery nice series. I love the statue !! I like this statue too and it could be all of us in our older years! What a beautiful setting and oh that moss on the trees-isn't it just so charming. Such wonderful photos, Eileen. I really enjoyed the Pileated ones. Oh, and the statue of the couple on the bench. Very nice! This is such a beautiful park to visit. I would love to come here. The woodpecker with its red head is such a treat. 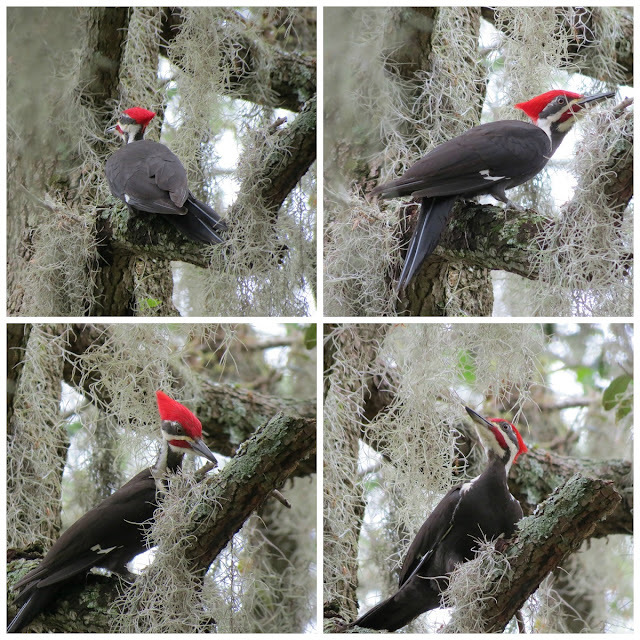 Fantastic shots of the Pileated and Anhinga! Very nice! oh, what a big catch, and swallowed the fish whole I guess like cormorants and other birds. Beautiful pictures. Nice pics . . .
Love the Woodpeckers in the Spanish Moss! I loved everything about the park, and you did a great job making it come to life. What a great park to stroll Eileen. I love all the sculptures and the birds you photographed, imagine eating a fish that big whole! What a beautiful park, Eileen! some neat sculptures! love the pileated shots! Eileen you got SO many fine shots!!!!! Those are aome interesting sculptures! What a great park. I love that fishing pole art, it's got such great form. What a great park, thanks for sharing these beauties! Wow...you have captured some great moments here! I wish the Pileated woodpeckers were seen around here...would love to see one. And that shot of the bird with the fish in his mouth was amazing! All wonderful photos, Eileen! It looks like a beautiful, well kept, park in Florida in which to stroll. I see pileated woodpeckers here at times--they are very pretty, and noisy! I would love to see one of those woodpeckers, they seem so huge compared to the variety that is around my area. Some really neat sculptures in that park. I agree that the shots of the woodpecker and anhinga are wonderful. I also loved the sculptures. Well done sculptures can really do wonders for a park. The Pileated Woodpecker is simply awesome. Such a beautiful bird! Those are fun sculptures and I love the pileated woodpeckers! Love seeing the pileated woodpecker in the mossy tree. That is one big fish dinner swallowed whole! Yikes! Beautiful scenery and sculptures. Looks like a lovely place to spend the day! wow! that woodpecker is fantastic! and those sculptures so interesting! that Anhinga looks a lot like some of our local cormorants! Hi Eileen I would love the Sculpture park it looks like a great place for a wander. Wow that's a down in one without touching the sides dinner for that Anhinga! Great photos! Thank you for some great pictures from Florida. I like the sculptures you took pictures of. Of course you know I will find the Pileated Woodpecker the most attractive bird because of the RED!!! But the Anhinga comes a close second - I really like the strange shapes they can contort their necks into!! We have similar birds down here - the common name is 'snake bird' because of the neck! Have a great week, my friend! We certainly love Florida...and you found some amazing treasures! Beautiful! What a unique and interesting park! If I am ever in Ocala I will be sure to visit. Beautiful photos. 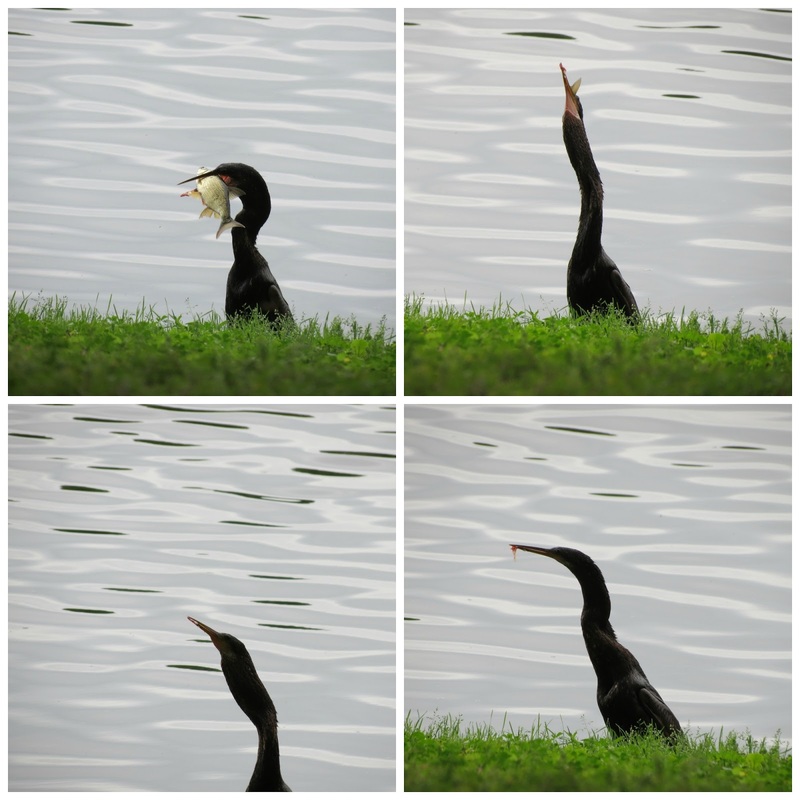 You captured some great shots of the anhinga. Thank you for the information about the mosaics and the program you use. What a pretty woodpeacker and a nice stroll through an unique park. Hi Eileen! Even birds are prettier in your side of the ocean. Wonderfull park you have there! that's a wonderful park. So many beauties in one place. I love all of your mosaics and especially the Cormorant with his bad manners ... can't you just hear your mother telling you not to take such a big bite? What a beautiful place, the sculptures, the trees, the birds (still have never seen a Pileated Woodpecker in real life). I would love to visit Ocala. And I would hope to be able to capture the beauty of it the way you have. Really nice, Eileen. Fantastic photos . Thanks for sharing . Have a good day ! Fabulous shots. I love the ones of the woodpecker. I will probably never visit Florida ("never say never"), so I appreciate your walk around Ocala. The birds, especially the woodpecker, made me smile. I think the sculptures add so much to the surroundings. What a beautiful place! Thanks for sharing, Eileen! Beautiful pileated Eileen....and I love the sculpture...what fun! What a wonderful place to visit. The art work is so whimsical, making the park fun. Great photos, too. Love the sculptures colourful, interesting and fun. I have enjoyed all your pictures. This city looks like an ideal place to spend a relaxing afternoon. During my recent visit to Yosemite I saw tons of bird including a woodpecker. Like to search for them when I listen the knocking on the wood. It really is a pretty city! And I too love the old South look of the hanging moss. What a lovely park! !Like the woodpecker photos! !What a beautiful bird! I dream of seeing Pileated Woodpeckers. Not one thus far in the season. They are around Vancouver but one has to be lucky to come across them, it seems. 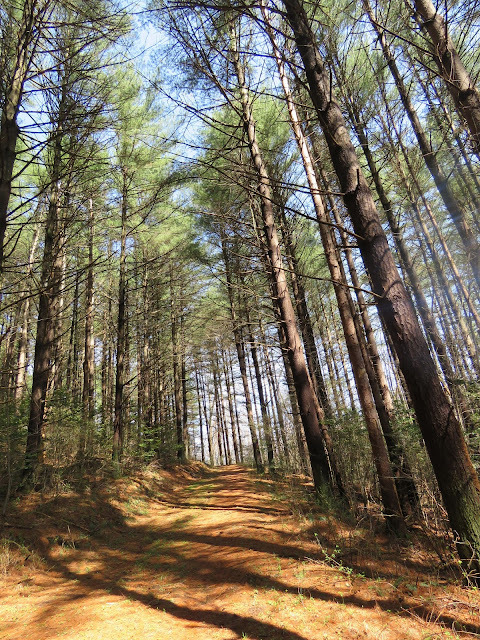 Your shots are wonderful and I loved Tuscawilla Park. Each bird and each statue held my interest. I smiled at you and hubby in your golden years, loved the painted horses, and thought the trees and pond absolutely beautiful! Thanks so much, Eileen! Pileated woodpeckers are such interesting birds. I love seeing them, although that's not very often. Wonderful shots of a garden park that would be fun to walk through. I like seeing sculptures outdoors. I have recently retired as well. I can't wait to get out there and shoot a few photos.